Kratos was a powerful warrior and leader who was feared throughout the civilized world. He and his army were impenetrable, or so they thought. In a fateful battle against an army of Barbarians, Kratos\' army was completely obliterated and Kratos himself was at the mercy of the leader of the Barbarians. In a last attempt, Kratos called out to Ares, the Greek God of War, and pledged his eternal loyalty if he would destroy all his enemies. Ares jumped at the opportunity to have such an amazing warrior at his mercy and quickly disposed of all the barbarians. 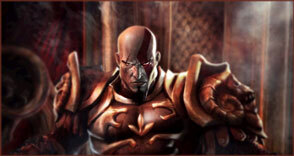 What Ares didn\'t know was that saving Kratos would eventually bring forth his own downfall!